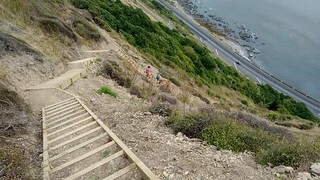 Saturday 9th April 2016 was the official opening day of the Paekakariki Escarpment Track—a new connecting track between Pukerua Bay and Paekakariki, above the railway line along the coast. Intense interest meant that organisers had to restrict entry for the initial day, but it’s now fully open to the public. 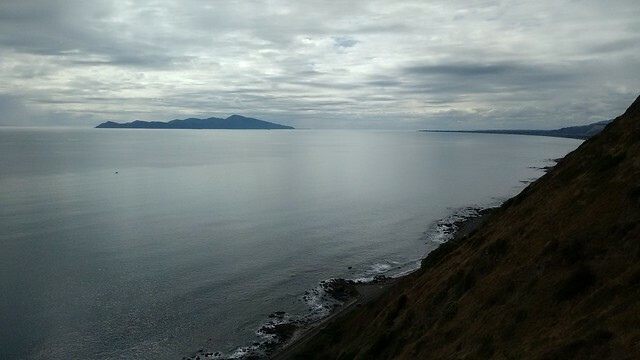 Location: Paekakariki to Pukerua Bay. Route: Walk south from Paekakariki to steps under the SH1 road bridge, onto the Paekakariki Escarpment Track, then follow it to Pukerua Bay. I never felt the desire to follow a narrow, steep track with squillions of other people on Saturday 9th April… or 400 as it turned out. I did, however, spontaneously decide to jump on a train on Sunday the 10th of April, to go and check it out. For me, this track is a welcome addition to the network of walking options in the Wellington region. 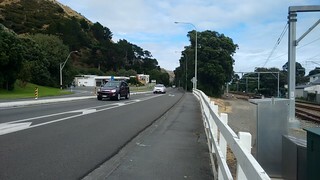 It naturally connects together two locations (Pukerua Bay and Paekakariki) which, until now, really had no practical on-foot connection short of walking alongside State Highway 1. I’ve walked that stretch several times. It’s not very exciting. Connecting these locations has been on people’s radar for some time, but it’s never been an easy thing. 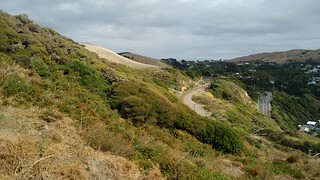 Development of the Te Araroa Trail, and the desire of its Trust to develop exactly this type of walking option, more recently became a catalyst for the track’s development. The first section was opened almost 3 years ago, at which time I checked it out, but the project ran short of funding and so stalled for a while. It’s fantastic to see that it’s now finished. 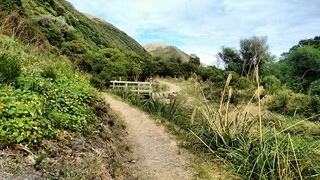 The Paekakariki Escarpment Track negotiates between a railway corridor and private land. 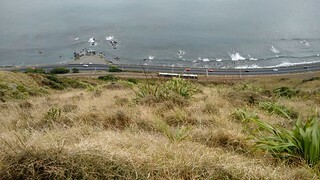 It spends much of its distance sidling a steep slope (think 50+ degrees), facing north-west out to sea and with a frequent view of Kapiti Island to the north. It includes a couple of amusing swing bridges to negotiate vaguely direct paths across a couple of catchments, but the route spends plenty of time indirectly negotiating around the edges of others, often dropping down and climbing up. With the constant State Highway traffic, and a train line, almost directly below, and working farm land above, this is not a remote wilderness experience, but it is a good walk. It’s roughly 10 km in length, with recurring steep climbing and descending as it sidles, and looks very exposed to incoming weather systems from the west. The combination of private land and terrain means that you should not expect to be able to exit the walk by any other point than either end. 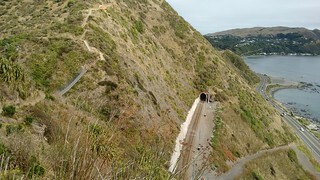 The track extends between the road/rail bridge just south of Paekakariki (look for steps alongside which lead underneath), and the now-closed Muri Railway Station. 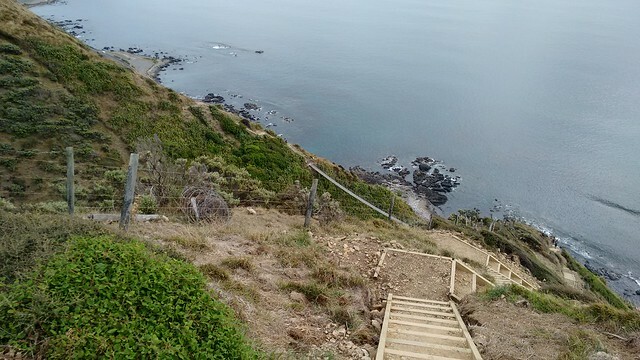 If you have time to burn at either end you could add a walk between Pukerua Bay around the coast-line to Plimmerton on the southern end, or into Raumati and Paraparaumu via Queen Elizabeth Park on the northern end. near to metropolitan train stations. For any of these options, public transport with the trains is a good option. I bought a $14 Dayrover ticket, hopped on a train to Paekakariki Station, then later returned from Pukerua Bay Station, but depending on circumstances some people might prefer to drive to a station at one end, then just catch the train back. It is, of course, also possible to walk from south to north. I saw a few people doing this, but this soon after the opening I think most were still following the official opening day logistic advice of walking north to south. Official advice is that it’s a 4 hour walk. I managed it in just over 2 hours, even despite spending some time stuck behind groups of slower people. 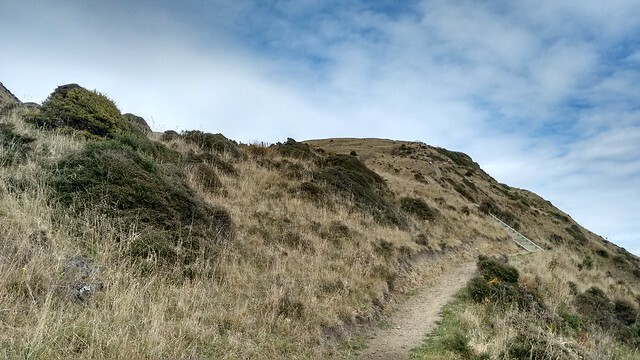 From what I saw, I believe it would be entirely possible for some groups of people to spend the better part of a day walking its length, especially if not used to this type of steepness, but it’s also going to be a common outing for runners. In other words choose your day wisely, watch the incoming weather, prepare for high wind and possible icy rain even if it’s not expected. Monitor your progress in terms of deciding whether you might need to turn around, and consider a plan for what might happen if you find yourself severely slowed or immobilised by an injury. If you’re a speed demon then you should also factor in that virtually the entire track is narrow. The terrain often makes it impractical to get around someone without risking a person falling over the side. Even where you meet polite people (as most people are), on a popular day you could spend a portion of your time negotiating your way past others. 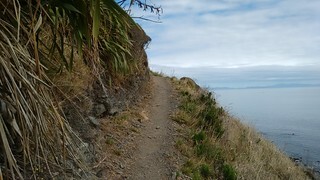 I left Paekakariki at about 11.30am, walking south and reaching the track’s entrance about 10 minutes later. The first part of the walk on this end, which has been publicly accessible for several years now, is relatively tame. It returns to the railway line on multiple occasions, occasionally venturing into native bush, and yet even here the elevation fluctuates up and down between about 50 vertical metres. There are outcroppings which you’d probably not want to fall off, but generally speaking I think most people would feel comfortable walking on this section. For me I thought some perspective is lost because the view over the coast is so consistent, at least on a day of appreciable weather, that it’s barely necessary to get so high to see everything. There’s still constant traffic below, frequently visible, and I’m not sure it made much difference between being 100 metres from it or 200 metres from it. If I’d been asked how high I was, then I think I’d have needed to think very carefully about what to answer because the reference points for determining that aren’t so obvious. This is about the high point, however. 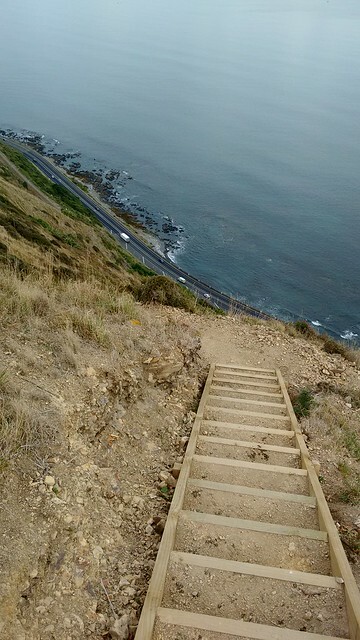 For anyone walking from the Pukerua Bay end it’d be fair to say that the worst of climbing is almost entirely over. It’s not the same when walking in the direction I was following. 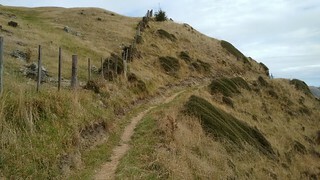 There’s a brief walk, for a few minutes, alongside the fence boundary with private farm-land at the top of the ridge. After this, the escarpment track begins to head down the hillside again, and many more steep steps. 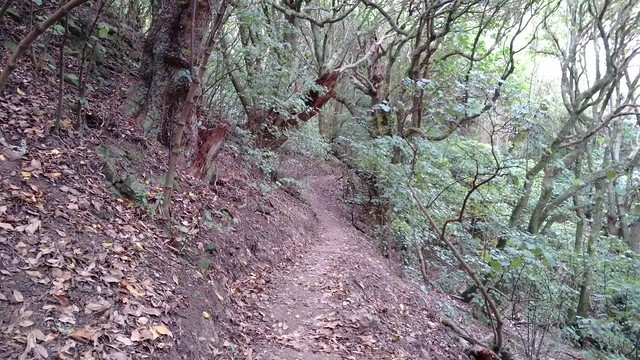 In the space of around 10 minutes (12.40pm by now) I’d dropped more than 100 metres of elevation, and the route drifts into a forest-covered gully for a short period, I guess where a (presently dry) creek comes down a groove in the hill-side. The track continues to sidle, gradually climbing upwards again, until (about 12.50pm for me) abruptly dropping another 80 metres or so into another gully — this one traversed by one of the route’s two swing bridges. It’s nice to see swing bridges still being installed. I’ve had an impression lately that authorities (DOC in particular) haven’t been so keen to use them in modern installations. 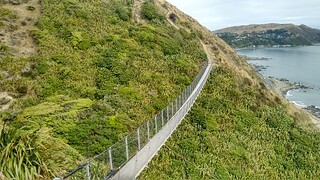 Compared with the earlier bridge, there’s a less severe drop to the bridge closest to Pukerua Bay, and a less severe climb on the other end of it. It’d be really wrong to say the route sidles flat from here onwards, because it clearly doesn’t. In fact, it undulates a few times by about 30 vertical metres each way. 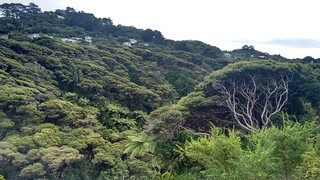 But the changes in elevation aren’t quite so pronounced as what’s come before, as the track enters a somewhat more civilised geography of gorse and scrub covered rolling hills nearer to Pukerua Bay. By about 1.15pm, I was back down walking the final stretch alongside the railway line, smiling at train drivers. The thriving metropolis of Pukerua Bay. As noted earlier, the track emerges at Muri Station, which was shut down a few years ago when upgrade costs necessary for the new train fleet weren’t deemed justified by its use. I didn’t know Pukerua Bay well enough to be familiar with any short-cuts to Pukerua Bay Station, so at this point I hopped out to the State Highway (which has a decent footpath on each side) and walked back. And that’s that, really. It was a nice walk. I’m really glad that it’s now possible to walk between these two points when previously it was not possible to do so without sharing the environment with a dose of asphalt and high speed traffic. I think it’s likely to be used a lot by people local to the area, and by Te Araroa walkers I’m sure, but it’s definitely worth going to see at least once for people in the Wellington region, and for anyone visiting who’s looking for something to do. I’ll probably be back in future. Thanks very much to everyone who’s put in so much effort towards getting this idea off the ground and then completed! Oh, and also there’s that view which wouldn’t stop following me, no matter how far I went. The track from Muri to Paekakariki is now well sign posted (if it wasn’t at the time), and is obviously well used. 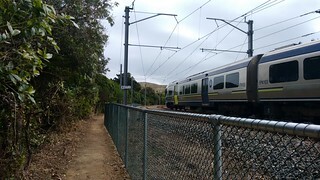 It follows Muri stations southbound station platform to the end, then through a reserve and along a road to another walkway and down to Paekakariki Station. About 10 minutes all up.